As I may have mentioned before, New York City is a tough place for breweries — it's freakin' NYC, and yet the brewing scene is far smaller than most other major American cities. I'm delighted to see it evolving at a steady pace this last year or two, with upstarts like Bronx Brewery, SingleCut, Rockaway Brewing Co., plus quite a few more upstate. 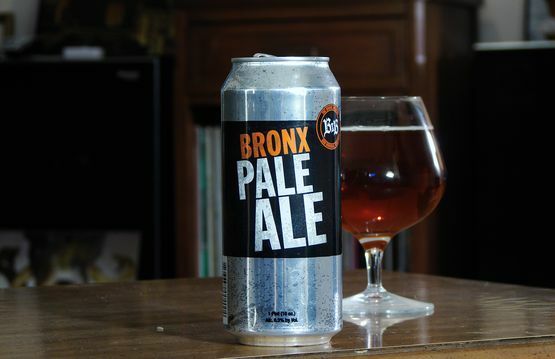 Bronx has a doubly interesting approach, in that the brewery only produces multiple variants of its pale ale. There's a lot you can do with just a pale ale, but if you're gonna go for something so specific, you better have a solid base beer to build around, right? 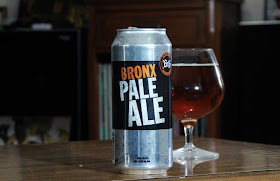 Well, small as they are, I got to try a few of Bronx's pale ale variants before ever drinking their core beer. But, like Sixpoint before them, Bronx recently teamed up with an out-of-state brewery to contract-brew and release their flagship beer in (stylish) cans, meaning I finally get to review this new entry into the New York market. Pouring a clear, copper / burgundy color, and with a 6.3% ABV, Bronx pale ale is going for something a bit heavier and maltier than an IPA while nudging into a similar ABV range. I respect that — it supports the notion that pale ales are about balance between malts and hops whereas IPAs are about pure hoppiness, even if there is some ABV overlap. The nose is sweet caramel malt and citrusy hops — classic. You know this one is going to be a bit sweeter just based on the color — Bronx Pale Ale must have a healthy dose of crystal malt in there — but the malts add some interesting depth on their own, with a mild nutty, bready character, rather than just the syrupy caramel-sweetness I dread. They're balanced by a solid bitterness and a bright fruity/floral hop character, exemplifying those vibrant American C hops. There's not a huge depth of hoppiness, but Cascade and Centennial are used to their best, capturing some of those original craft pale ale flavors while still seeming fresh and satisfying. Get this one fresh, or the malts will quickly take over. (Unless you like it that way; it's in a can, so it should hold up relatively well). I don't know what sort of distribution this will get, but if it makes it into bodegas alongside the other big pale ales and session beers, it's a better choice than most for your weekend consumption. Availability: Year-round. 16 ounce cans.